In his affidavit, security aviation specialist Michael K. Pilgrim gives a point-by-point synopsis of security at Boston Logan Airport before and after 9/11. Pilgrim attests that the airport had one of the most advanced security systems in the United States, even though it was still severely flawed and easy to manipulate. 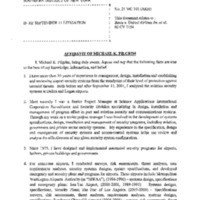 “Affidavit of Michael K. Pilgrim ,” September 11 Digital Archive, accessed April 19, 2019, http://911digitalarchive.org/items/show/96756.